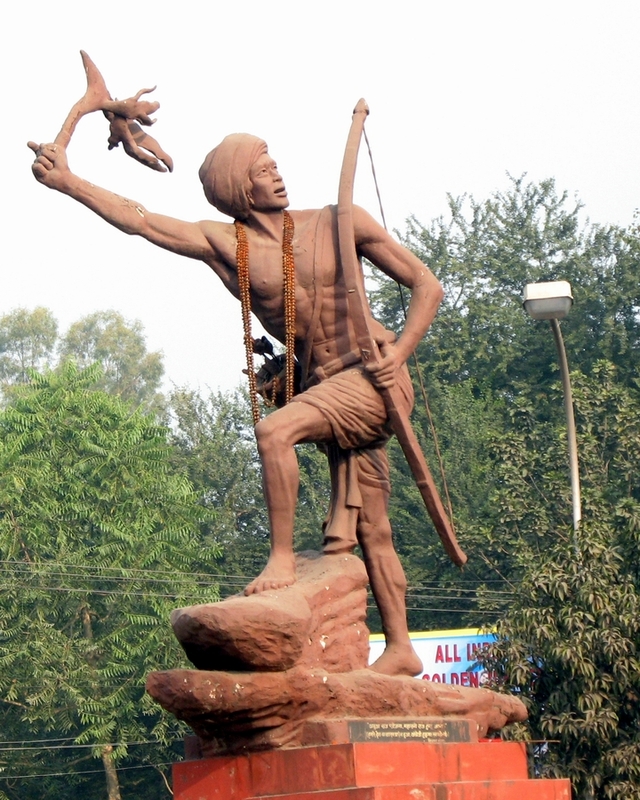 Birth anniversary of Birsa Munda was observed on November 15th. In recognition of his impact on the national movement, the state of Jharkhand was created on his birth anniversary in 2000. Bisra Munda was a folk hero and a tribal freedom fighter hailing from the Munda tribe. He was a spearhead behind the Millenarian movement that arose in the Bihar and Jharkhand belt in the 19th century under the British colonisation. He is also known as ‘Dharti Abba’ or the Earth Father. Bisra wanted to reform the tribal society and so, he urged them to let go of beliefs in witchcraft and instead, stressed on the importance of prayer, staying away from alcohol, having faith in God and observing a code of conduct. Based on these, he started the faith of ‘Birsait’. Bisra started a movement called ‘Ulgulan’, or ‘The Great Tumult’. His struggle against the exploitation and discrimination against tribals led to a big hit against the British government in the form of the Chotanagpur Tenancy Act being passed in 1908. The act restricted the passing on of land from the tribal people to non-tribals. Climate Change Performance Index (CCPI) 2018 has been released by environmental organisation Germanwatch. The report was made public on the sidelines of the UN Climate Change negotiations (COP23) in Bonn. The Climate Change Performance Index (CCPI) is an instrument covering 58 countries and supposed to enhance transparency in international climate politics. Its aim is to encourage political and social pressure on those countries which have, up to now, failed to take ambitious actions on climate protection as well as to highlight countries with best-practice climate policies. On the basis of standardised criteria, the index evaluates and compares the climate protection performance of 58 countries that are, together, responsible for more than 90% of global energy-related CO2 emissions. 80% of the evaluation is based on objective indicators of emissions trend and emissions level. 20% of the index results are built upon national and international climate policy assessments by more than 200 experts from the respective countries. India is ranked 14th, an improvement from its 20th position last year. China, with its high emissions and growing energy use over the past five years, still ranks 41st. The bottom three of the index is formed by Korea (58), Iran (59) and Saudi Arabia (rank 60), all of which are showing hardly any progress or ambition in reducing its emissions and energy use. As per the report, fifty-six countries and the EU are together responsible for about 90% of global greenhouse gas emissions. The report notes that global energy transition is taking up speed but no country is doing enough. For this, the countries have to strengthen targets and implementation. The data show encouraging growth in renewable energy, ever cheaper prices for solar and wind energy and successes in saving energy in many countries. This was responsible for stabilising global energy CO2 emissions in the last three years. But progress is achieved much too slow for a fully renewable energy based world economy in a few decades, because growing oil and gas consumption is higher than the welcomed reduction in coal use. The Rajasthan Dharma Swatantraya Vidheyak was passed by the Assembly in 2008. The legislation seeks to stop conversions through use of “force or allurement or by fraudulent means”. An offence under the Act is cognizable and non-bailable. The punishment for violation of the provisions of the Act can be a minimum two years simple imprisonment, which may be extended up to five years and a fine of up to Rs.50000. It also contains a clause for cancellation of registration of organisations held guilty of abetting conversions. Senior officials of India and European Union (EU) recently held discussions on the long-stalled free trade pact, officially dubbed as Bilateral Trade and Investment Agreement (BTIA) and expressed willingness to address issues in a time-bound manner. Launched in June 2007, the negotiations for the proposed BTIA have witnessed many hurdles with both sides having major differences on key issues like intellectual property rights, duty cut in automobile and spirits, and liberal visa regime. 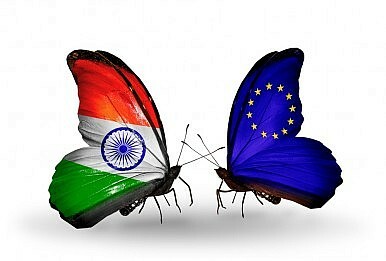 On 28th June 2007, India and the EU began negotiations on a broad-based Bilateral Trade and Investment Agreement (BTIA) in Brussels, Belgium. These negotiations are pursuant to the commitment made by political leaders at the 7th India-EU Summit held in Helsinki in October 2006 to move towards negotiations for a broad-based trade and investment agreement on the basis of the report of India-EU High Level Technical Group. Need for a free trade agreement: India and the EU expect to promote bilateral trade by removing barriers to trade in goods and services and investment across all sectors of the economy. Both parties believe that a comprehensive and ambitious agreement that is consistent with WTO rules and principles would open new markets and would expand opportunities for Indian and EU businesses. The military in Zimbabwe has launched a ‘coup’ on November 15, 2017, calling it a “bloodless correction” to target “criminals” surrounding long-time leader Robert Mugabe. Robert Mugabe is the only leader Zimbabwe had since it won freedom from British colonial rule in 1980. At 93, Mr. Mugabe is the world’s oldest head of state. His poor health has fueled a bitter succession battle as potential replacements jockey for position. His lengthy rule has been marked by brutal repression of dissent, mass emigration, vote-rigging and economic collapse since land reforms in 2000. What triggered the current stand-off between military and the civilian government? The current crisis stems from a political shake-up earlier this month, but the roots of it go back much further. 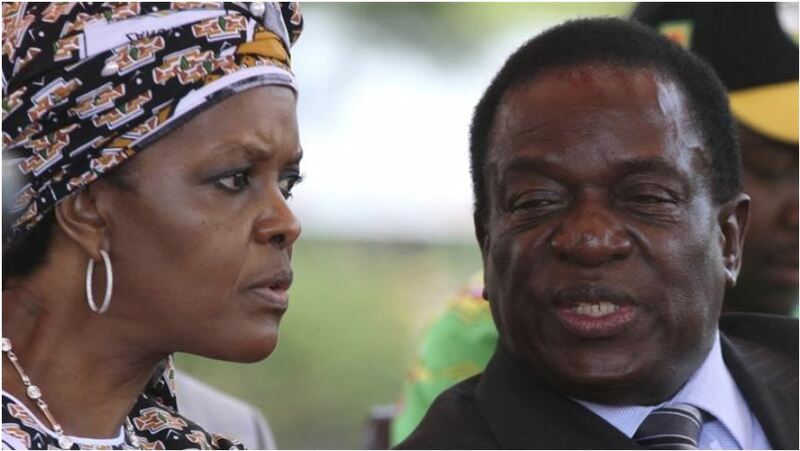 On Nov. 6, Mugabe decided to fire Vice President Emmerson Mnangagwa. The move caused unrest in the president’s ruling ZANU-PF party and the army. Mnangagwa has support among the military and was seen as a potential successor to Mugabe. It’s unclear. There’s still a ton of uncertainty about the military’s intentions. There has been no sign of violence so far in the military action, and there have not been public demonstrations either in favor of it or against it. Foreign officials and regional leaders have called for calm and the country to avoid conflict, saying they are closely monitoring the situation. Embassies in Zimbabwe have issued statements instructing their citizens in the country to shelter in place and monitor the news for updates. RBI Governor Urjit Patel has been appointed to the Financial Stability Institute Advisory Board or the Bank of International Settlement (BIS), a global financial organisation owned by major central banks from across the world. The FSI was jointly created in 1998 by the BIS and the Basel Committee on Banking Supervision. Among other mandates, the FSI seeks to promote cross- sectoral and cross-border supervisory contacts and cooperation. The FSI Advisory Board was originally created in 1998. The Advisory Board will provide strategic advice to help the FSI continue to meet its mandate in a way that is responsive to the changing needs of its key stakeholders around the world. To achieve this objective, the Advisory Board will comprise a small but diverse group of central bank Governors, heads of financial sector supervision and chairs of standard-setting bodies and regional supervisory groups. 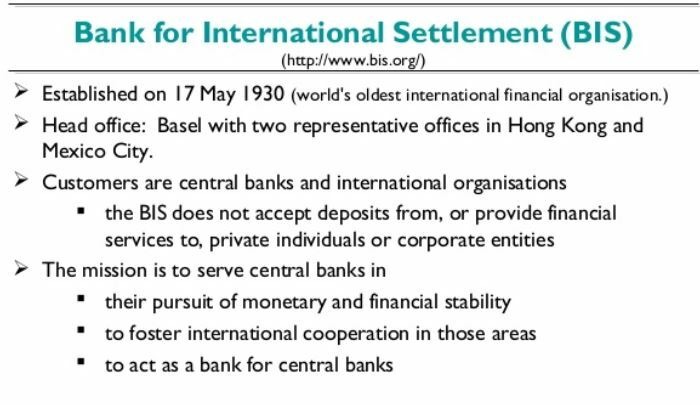 The Bank for International Settlements (BIS) is the world’s oldest international financial organization. It was established in May 1930. It has 60 member central banks, representing countries from around the world that together make up about 95% of world GDP. The government has given the go-ahead for setting up India’s first mega coastal economic zone (CEZ) at the Jawaharlal Nehru Port in Maharashtra as part of a plan to develop 14 such industrial clusters to spur manufacturing and generate jobs. The plan envisages a total investment of Rs 15,000 crore in the first phase and creation of more than 1.5 lakh jobs. The idea is to attract large firms interested in serving the export markets as they would bring with them technology, capital, good management and links to the world markets. This in turn would help create an ecosystem around them in which productive small and medium firms would emerge and flourish. The Union Cabinet had last year approved setting up of 14 mega CEZs under the National Perspective Plan of the Sagarmala Programme, with an aim to promote development of industrial clusters around ports, encourage portled development, reduce logistics cost and time for movement of cargo, enhance global competitiveness of India’s manufacturing sector and create hubs of job creation. 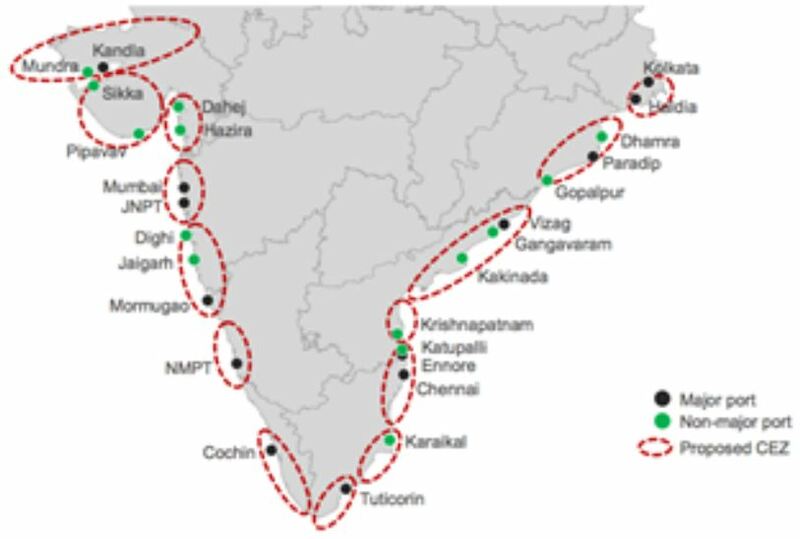 CEZs are spatial economic regions comprising a group of coastal districts or districts with a strong linkage to ports in that region to tap into synergies with the planned industrial corridor projects. These zones are expected to provide business-friendly ecosystem including ease of doing business, ease of exporting and importing, swift decisions on applications for environmental clearances, and speedy water and electricity connections. Taking into account the serious pollution levels in Delhi and adjoining areas, Petroleum Ministry in consultation with Public Oil Marketing Companies has decided for preponement of BS-VI grade auto fuels in NCT of Delhi w.e.f 01.04.2018 instead of 01.04.2020. This measure is expected to help mitigate the problem of air pollution in NCT of Delhi and surrounding areas. Introduced in the year 2000, the Bharat norms are emission control standards put in place by the government to keep a check on air pollution. Based on the European regulations (Euro norms), these standards set specifications/limits for the release of air pollutants from equipment using internal combustion engines, including vehicles. Typically, the higher the stage, the more stringent the norms. 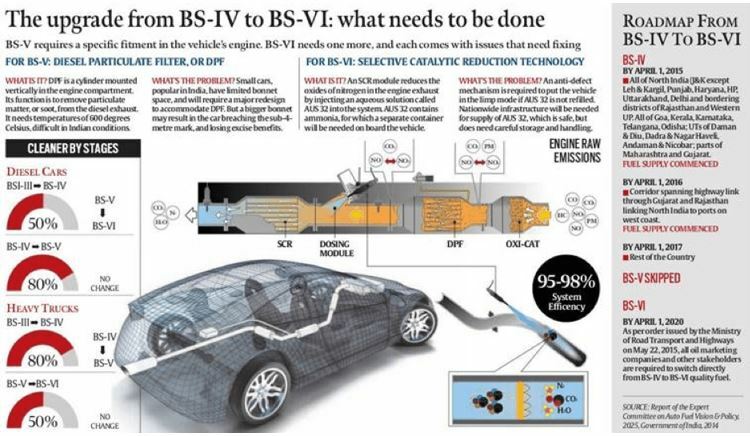 The particulate matter emission in BS-V and BS-VI is same for diesel cars though it is 80% less than BS IV. The nitrogen oxide (NOx) level is, however, 55% less in BS-VI over BS-V which in itself is 28% lower than BS IV. The sulphur content in fuel norms for diesel and petrol under both BS-V and -VI standards does not change at 10 ppm, though it is substantially less than 50 mandated for both the fuels under BS-IV. Rolling out the BS VI standard nationally, skipping BS V, has significant cost implications for fuel producers and the auto-mobile industry, but its positive impact on public health would more than compensate for the investment. Google Doodle on November 15th paid tribute to Cornelia Sorabji, the first woman to practice law in the country, on the occasion of her 151st birth anniversary. Cornelia Sorabji was the first woman advocate of India. She created history by becoming first woman lawyer in 1924. She was the first woman permitted to attend Bombay University, where she excelled. She then went on to become the first Indian woman to study law at Oxford University in 1892. Next story Insights MINDMAPS: “Economic Development and Social Progress” and “Strategic Importance of Quadrilateral”.